Located in the southeastern part of the country, Odisha boasts of a rich culture and heritage. Odisha features many world famous tourist destinations. You’ll get to visit the predominant places of Buddhist pilgrimage in the state in this specially designed Best Of Odisha Buddhist Tours. Having embraced the rich Buddhist heritage from the 6th century BC, Odisha has its share of many Buddhist sites scattered across the length & breath. Moreover, there are some which not only have the largest concentration of Buddhist remains but are also a must-visit for instant enlightenment. Buddhist teachings from all sects (including Hinayana, Mahayana, Tantrayana and offshoots such as Vajrayana, Kalacakra Yana and Sahajayana) are believed to have been conducted in Odisha, giving the state a rich Buddhist heritage. Best Of Odisha Tours will give you the opportunity to indulge in this rare journey. Buddhist Tours in Odisha are getting popular among the voyagers nowadays and Pilgrimage in Odisha is a worthy thing to do as there are numerous Pilgrimage Sites in Odisha. The itinerary includes Dhauligiri, Udayagiri and Lalitgiri which captures many of the essential sights in Odisha. You can be assured that you’re going to have the Best Of Odisha Buddhist Tours. DESTINATIONS COVERED :BHUBANESWAR – KONARK – PURI – LALITGIRI & RATNAGIRI & UDAIGIRI – LANGUDI – BHUBANESWAR. Upon Arrival at Bhubaneswar Airport/Railway station, transfer to Hotel. Rest of the day free for own activities. Overnight. Full day city tour of Bhubaneswar Temples famous for beautiful architecture: Lingaraj, Rajarani, Mukteswar Temple. Later visit Odisha State Museum ( Closed on Monday) with a lot of Buddhist Sculptors collected from different Buddhist archaeological sites of Odisha and Khandagiri & Udaygiri Jain Caves of 2nd Century B C. Overnight at a hotel. Visit Dhauli Peace Pagoda, famous for Asokan Rock Edicts and Place where the battle of Kalinga was Fought which made a great change of Ashok mind so that he became Buddhist. Later visit Pipili applique works and World heritage site Sun Temple of Konark (Watch the Buddhist influence on this temple) & famous Jagannath Temple and Back to Bhubaneswar. Overnight at Hotel. 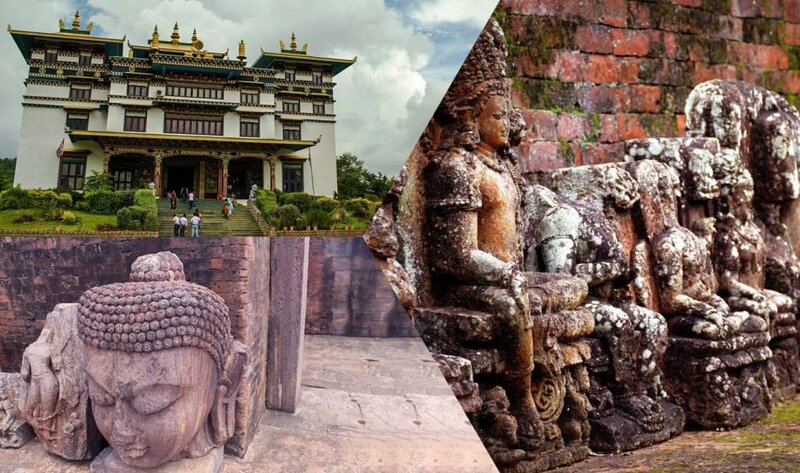 Full day Excursion to Lalitigiri (Archeological site of a Buddhist Monastery from 4th to 8th Century AD) with Monastery parts and many votive Stupa, all different Buddhist sculptors with Chaita hall and a Huge stupa from where caskets of Budha’s relic is available. Ratnagiri, the Largest Buddhist monastery we have till know, flourished from 4th to 14th century AD with most of the sculptors of the Vajrayanic sect, hundred of Votive Stupa & brick Stupa and huge monastery. Later visit Udaygiri, Another huge Buddhist monastery which still under excavation, back to Bhubaneswar. Overnight at Hotel. Breakfast at the hotel. Check out & drive towards Bhubaneswar airport /railway station for onwards journey.